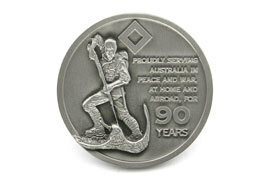 Pewter antique finish medallion also available in gold, silver, brass or copper. Various sizes from 30mm-60mm available with or without colour paint fill. Medallions can be individually engraved with names or numbers and can also be supplied with presentations boxes, ribbons or lanyards.